Every business organization is a part of the business environment, within which it operates. No entity can function in isolation because there are many factors that closely or distantly surrounds the business, which is known as a business environment. It is broadly classified into two categories, i.e. micro environment, and macro environment. The former affects the working of a particular business only, to which they relate to, while the latter affects the functioning of all the business entities, operating in the economy. 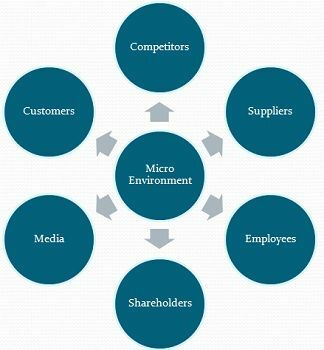 While microenvironment has a direct impact on the business activities, the macro environment is a general business environment, which influences all business groups at large. It is important to learn the business environment, so as to understand the effect of various forces on business. 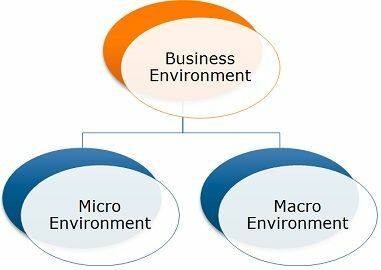 Take a read of the given article to know the difference between micro environment and macro environment. Meaning Micro environment is defined as the nearby environment, under which the firm operates. Macro environment refers to the general environment, that can affect the working of all business enterprises. Elements COSMIC, i.e. Competitors, Organization itself, Suppliers, Market, Intermediaries and Customers. PESTLE, i.e. Population & Demographic, Economic, Socio-Cultural, Technological, Legal & Political and Environmental. Microenvironment refers to the environment which is in direct contact with the business organization and can affect the routine activities of business straight away. It is associated with a small area in which the firm functions. Microenvironment is a collection of all the forces that are close to the firm. These forces are very particular for the said business only. They can influence the performance and day to day operations of the company, but for a short term only. Its elements include suppliers, competitors, marketing intermediaries, customers and the firm itself. Suppliers are the ones who provide inputs to the business like raw material, equipment and so on. Competitors are the rivals, which compete with the firm in the market and resources as well. Marketing intermediaries may include wholesalers, distributors, and retailers that make a link between the firm and the customers. Customers / Consumers are the ones who purchase the goods for their own consumption. They are considered as the king of business. The firm itself is an aggregate of a number of elements like owners like shareholders or investors, employees and the board of directors. 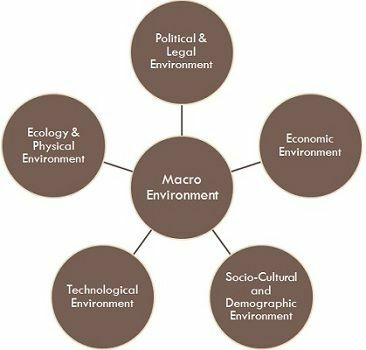 The general environment within the economy that influences the working, performance, decision making and strategy of all business groups at the same time is known as Macro Environment. It is dynamic in nature. Therefore it keeps on changing. It constitutes those outside forces that are not under the control of the firm but have a powerful impact on the firm’s functioning. It consists of individuals, groups, organizations, agencies and others with which the firm deals during the course of its business. The study of Macro Environment is known as PESTLE Analysis. PESTLE stands for the variables that exist in the environment, i.e. Population & Demographic, Economic, Socio-Cultural, Technological, Legal & Political and Environmental. These variables, consider both economic and non-economic factors like social concerns, government policies, family structure, population size, inflation, GDP aspects, income distribution, ethnic mix, political stability, taxes, and duties, etc. Microenvironment is the environment which is in immediate contact with the firm. The environment which is not specific to a particular firm but can influence the working of all the business groups is known as Macro Environment. The microenvironmental factors are controllable by the business. However, the macroeconomic variables are uncontrollable. The elements of the microenvironment affect directly and regularly to the firm which is just opposite in the case of the macro environment. The study of the microenvironment is described as COSMIC analysis. Conversely, PESTLE Analysis is a study of the macro environment. Microenvironment and macro environment, both cover the overall environment of business. So, they are more complementary rather than contradictory. The study of these environments will help to know the strength, weakness, opportunity and threat of business. In which category would service provider come? Thank you so much for the article! Very well stated! Well written and it will definitely assist with my strategy module this year. thank you.